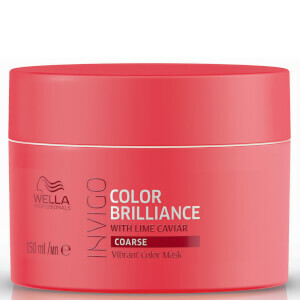 Protect your colour with Wella Professionals INVIGO Color Brilliance Shampoo for Coarse Hair, a revitalising cleanser formulated with antioxidant-rich Lime Caviar. The pH-optimised shampoo helps to seal the hair cuticle to lock in colour, whilst using a Copper Encapsulating Molecules to improve vibrancy and shine. 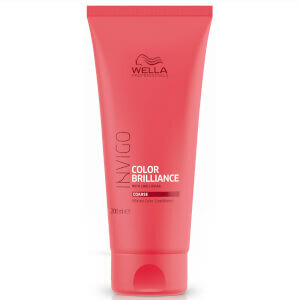 Expertly washing away any dirt, excess oil and product build-up for a fresher feeling, the shampoo leaves you with clean, healthy and ultra-bright tresses. Apply to damp hair and massage gently into a lather. Rinse thoroughly. Water/Aqua/Eau, Sodium Laureth Sulfate, Sodium Chloride, Cocamidopropyl Betaine, PEG-3 Distearate, Citric Acid, Polyquaternium-10, Fragrance/Parfum, Acrylates/Steareth-20 Methacrylate Copolymer, Glycerin, Sodium Benzoate, Amodimethicone, Methylparaben, Tocopheryl Acetate, Sodium Hydroxide, Propylparaben, Polyquaternium-6, Limonene, Trisodium Ethylenediamine Disuccinate, Hydroxypropyl Guar Hydroxypropyltrimonium Chloride, Disodium EDTA, Glyoxylic Acid, Linalool, Trideceth-12, Hexyl Cinnamal, Benzoic Acid, Cetrimonium Chloride, Microcitrus Australasica Fruit Extract.